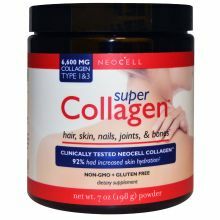 As a dietary supplement, dissolve one scoop of Super Collagen™ Dietary Supplement with one spoon of water or orange juice. Then add 6-8 ounces more liquid, and stir vigorously. For better results, use a blender. For optimum nutritional results, drink as suggested on an empty stomach and wait 30 minutes before eating. Enjoy enhanced results when paired with NeoCell™ hyaluronic acid products.